This house for a family of five is an exploration of the possibilities of integrating environmental concerns at a fundamental level within a contemporary idiom. Concerns over establishing a relationship with the garden and maximising daylight penetration in a north facing building, where east and west facades are blank,dictated the organization of family rooms at ground and first floor connected by a narrow void. This layout is expressed architecturally as a slipped tube’ of space, coded materially in sandblasted concrete, stratified from front to rear,divided programmatically with joinery boxes. allowed for structural items but non-structural elements have 70% of their cement content replaced.To achieve a sustainable design,a finite element analysis was carried out on the structure to ensure only the minimum reinforcement steel was used and structural walls were kept as thin as possible.To maximise space, steel column sections are introduced at ground level to support the cantilevering slaband wall overhead. At the upper level, reinforced concrete walls double up as deep concrete beams (which cantilever) to ensure that economies a re achieved in the design. The house has been designed to achieve an A -Rating using the DEAP Methodology with particular emphasis on the passive elements. Based on a model of heavy mass to absorb and retain heat, and wrapped externally with a highly insulated skin, insulation levels were increased substantially beyond the levels required. 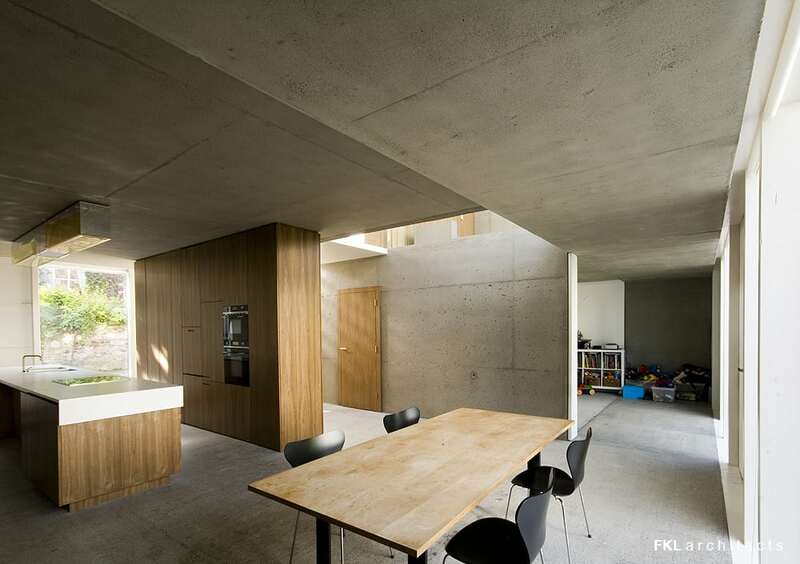 The concrete rising walls are thermally isolated from the slab using Schoeck Novomur from Contech, ensuring a continuity of the insulation zone wrapping the concrete structure and avoiding thermal bridging at this important junction. Under-floor heating is controlled by individual 7-day room thermostats to ensure that the boiler always operates at peak efficiency.